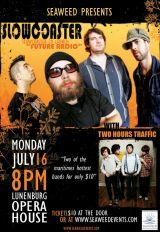 Cape Breton's Slowcoaster launch their new CD "Future Radio" at the Lunenburg Opera House on Monday 16 July. Show also features Two Hours Traffic and the Broomhandles. “Future Radio” CD available from July 24 on www.cduniverse.com, so be one of the first to buy! Fyi, Slowcoaster plays up beat saltwater funk rock hip-hop jazz Afro-Cuban reggae grooves on guitar, bass guitar, drums, percussion and voice. The by's combine above average musicianship with guitarist / vocalist Steven MacDougall's stellar songwriting to produce a danceable, sing-alongable, funny, affecting, noir-ish set of music that's both as "tight as a whip" and just a bit sketchy.